These delicious Portuguese cod patties (rissóis de bacalhau) take a bit of time to make but they are worth the effort. Cook the cod fillets in water. Once cool, remove skin and bones, shred using your fingers and put aside the water that you cooked the cod. Heat the butter in a small saucepan over medium heat. Add the chopped onion and then the parsley. Cook over medium heat until the onion softens. Add the shredded cod and then the flour gradually to avoid lumps. Add a little of the cod cooking water slowly until soft and season with pepper to taste. Remove from the heat, add the beaten yolks stiring well and put aside. Boil the 2 cups of water with salt to taste, the butter and the lemon peel. Add the flour all at ounce and stir well. When the dough peels off the bottom, put it on a surface sprinkled with flour, knead it well with your hands. Extend the dough well and cut it evenly in about 12 pieces (patties), divide the filling between them by placing it on one side of each patty. Fold the empty side over the filling and seal it by pressing the edges of both sides together. Brush each patty with the egg and pass it through the breadcrumbs. Fry in very hot oil until golden brown. 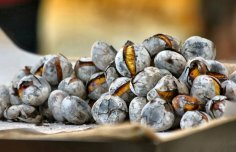 How to make Portuguese roasted chestnuts (castanhas assadas), great snack, enjoy. How to make Portuguese bean tarts. These sweet golden yellow Portuguese yogurt tarts are delicious and very easy to make.